After being challenged to a game of tic-tac-toe by Kit Kat, Oreo wisely declined in a way that would make fictional characters Dr. Stephen Falken and David Lightman proud. As I explained in a recent post, movies often contain lessons mixed in with the car chases and beautiful people living extraordinary lives. If you grew up in the 1980’s, you probably remember that in the 1983 movie “WarGames,” David Lightman, a young computer hacker played by Matthew Broderick, unwittingly accessed WOPR, a United States military supercomputer that was designed by Dr. Stephen Falken to predict possible outcomes of nuclear war. In the process, Lightman unknowingly almost starts World War III. At the climax of the movie, Dr. Falken and Lightman try to teach WOPR that nobody wins in a war. The first lesson begins with multiple games of tic-tac-toe before moving on to war simulations. If you follow social media marketing news at all, you know that Oreo earned praise for the tweet they sent out after the power went out at the Superdome during this year’s Super Bowl. They also had success with this real-time marketing strategy during the airing of the 85th Academy Awards. Other brands are taking note and are trying to replicate Oreo’s success. 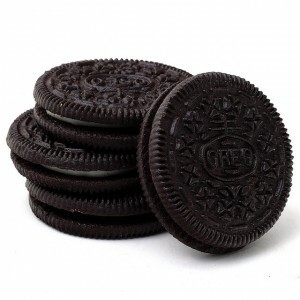 Therefore, it is not surprising that when Laura Ellen, a Twitter user from Manchester, UK, tweeted that she was following both Kit Kat and Oreo on Twitter, Kit Kat jumped at the chance to challenge Oreo to a friendly game of tic-tac-toe in an effort to fight for Ms. Ellen’s affections. As a post on Mashable.com points out, this scored huge points with Ms. Ellen. And, judging from the number of retweets and favorites, with the clever use of Kit Kats for Xs and (potentially) Oreos for Os, Kit Kat also scored points with the general public. When faced with the option of playing Kit Kat in a public game of tic-tac-toe, Oreo decided to decline with style and grace. In my opinion, that was a brilliant move. As Lauren Indvik points out in the article on Mashable.com, there are possible negative consequences of being the loser in a game that could get old real fast. By declining to play the game by complimenting the taste of Kit Kats, Oreo found a way to create a win-win situation. Kit Kat gets a compliment, and Oreo gets some free advertising from Kit Kat, not to mention all the free publicity it received by the media covering the ad campaign. As an added bonus, I would be willing to bet that this ad campaign made many people think of the movie WarGames. Knowing that this is a movie that is beloved by tech geeks around the world, this was a perfect move for Oreo to make in a social media ad campaign. Was it intended? Only the digital agencies involved could tell you that for sure. With some things in life, nobody ever wins. In those cases, the best solution is not to play the game. In the 1980’s movie WarGames, we learned that nobody wins in a nuclear war. The same could often be said in head-to-head competition in the marketplace. In the case of the Kit Kat tic-tac-toe challenge, Oreo proved wise enough to demonstrate that there is room enough for both brands in the marketplace, and that there is no need to show its skill in a game that often ends in a stalemate. By declining the game in the way that they did, they created a win-win scenario for both brands. Photo credit: Torben Bjørn Hansen on Flickr.